iPhone 7 and iPhone 7 plus are the best of iphones you would always want to use every time because of its wonderful feature. If you have been searching for where to get the price till this moment, then search no more because what you are looking for is here on your court. So to have it, iPhone 7 and iPhone 7 Plus is now present on Jumia, Konga and Slot online stores. The Wonline stores are the best you can get the phone from in the country. As it will be delivered to your door step once it is ordered. Konga.com being the largest online mall in Nigeria and was active by July 2012, came out with the aim of becoming the best commerce and trade in the whole of Africa. 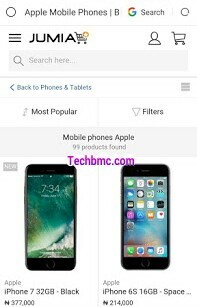 konga online market has many brands of smartphones of which iPhone 7 and iphone 7 plus device is among. Here goes the price of iPhone 7 on konga online store. SLOT Systems Limited is a household name for affordable and durable mobile phones for all levels/classes of people. As an indigenous company, SLOT does not only sell phones but also provide first class after sales support that is incomparable in any Western African information technology sector. ✔ Buy From Jumia market Here. ✔ Buy From Konga online store Here.